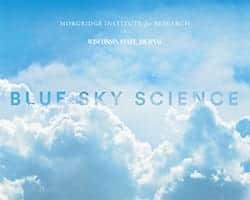 News & Stories > Blue Sky Science > How do we purify dirty water? How do we purify dirty water? Drinking water treatment processes are physical and chemical processes. An example of a chemical process would be adding a disinfectant, like chlorine, that would be used to kill pathogens. Pathogens are things like bacteria or viruses that would make you sick if you drink them. We also use more physical processes like filtration or sedimentation to remove particles, any solid things that we don’t want in our water. A wastewater treatment plant will use some of those same chemical and physical processes, but also biological processes. We would use bacteria or other kinds of microorganisms that are basically taking our waste, like what goes down our toilets, and using it as food. That’s how we get rid of the waste that we put in water. Typically, we get our drinking water from groundwater — water deep under the ground or surface water like a lake or a reservoir. Those tend to be cleaner and what we like to use for drinking water. But a lot of places like California are dealing with water scarcity. Many of those places are thinking about using treated wastewater for drinking. Most of the time, this water is used for irrigating crops or things like golf courses or landscapes. But treated wastewater can be made very, very clean. Some places like Singapore actually use it for drinking water. There are places in the U.S. and other places that are considering going this route as water becomes more of a scarce resource. One ongoing project we’re working on in our lab is looking at the photodegradation of lampricides. Lampricides are pesticides that are used to kill the sea lamprey, an invasive species in the Great Lakes. We look at how these two compounds react with sunlight and how sunlight naturally causes them to degrade. We have to look at the costs versus benefits anytime we use chemicals, like pesticides, in the environment. In this case, we’ve shown that the lampricides degrade and form things that are not toxic and don’t adversely affect our water supply.